The SecurePay Direct Post Payment Gateway asset allows you to create a Direct Post payment gateway, providing users with a secure way to pay for their items. For more information, visit the SecurePay website. SecurePay online payment gateway and eCommerce solutions are only available to users within Australia. A successful transaction originating from a SecurePay Direct Post Payment Gateway will generate the E-Commerce Payment Completed Trigger Event. For more information, refer to the Trigger Events chapter in the Triggers manual. Please note that the SecurePay online payment gateway posts payment information directly to a remote server. Squiz Matrix does not personally handle any of the sensitive information managed by this payment gateway and is thus exempt from PCI compliance standards. Once you have added a SecurePay Direct Post Payment Gateway, you can configure its settings on its associated asset screens. The majority of these screens are the same or similar to those for a Standard Page and are described in the Asset Screens manual. In this chapter, we will describe the Details and Display Formatting screens, which are different for a SecurePay Direct Post Payment Gateway. When you create a SecurePay Direct Post Payment Gateway, the Display Format Bodycopy asset is automatically created beneath it, as shown in the figure to the right. You can use this Bodycopy to define the contents and layout of the SecurePay Direct Post Payment Gateway form. This Bodycopy can also be accessed via the Display Formatting screen. The Details screen allows you to configure the settings of the SecurePay Direct Post Payment Gateway. For more information about the Status, Future Status, Thumbnail and Details sections, refer to the Details Screen chapter in the Asset Screens manual. This section allows you to enter your SecurePay account details, as well as configure the general settings of the payment gateway. In order to accept payments on the Direct Post Payment Gateway, you will need to obtain a SecurePay account. For more information, visit the SecurePay website. Merchant ID: enter your merchant ID, supplied to you by SecurePay Customer Support once your account has been actived. Password: enter your transaction password, supplied to you by SecurePay. Transaction Type: select the payment type for individual transactions on the SecurePay Direct Post Payment Gateway. This field allows you to select between the regular Payment type and Payment with FraudGuard Service. Please note that SecurePay's FraudGuard service must be correct configured on your SecurePay account. By default, this field is set to AUD. Card Types: select the card types that will be available on the SecurePay Direct Post Payment Gateway. If a card type is not selected, users will not be able to select that card type during the transaction process. By default, all card types are selected. This section allows you to modify the payment gateway to function in Test Mode. The Test Mode section of the Details screen is shown in the figure below. In the Enable Test Mode field, select whether or not to use the payment gateway for testing purposes only. If this field is set to Yes, the payment gateway will not process any payments and the Card Number field on the SecurePay Direct Post Payment Gateway form will be replaced with the test drop down menu, as shown in the figure below. This section allows you to source address information for the SecurePay Direct Post Payment Gateway, to display on the gateway via keyword replacements available on the Display Format Bodycopy. If your payment gateway has been configured with FraudGuard, these fields can also be used to pass billing information to SecurePay. The Pass through Variables section of the Details screen is shown in the figure below. First Name Variable Name: enter the pass through variable key for the first name of the billing address. Last Name Variable Name: enter the pass through variable key for the last name of the billing address. Street Variable Name: enter the pass through variable key for the street of the billing address. City Variable Name: enter the pass through variable key for the city of the billing address. Postcode Variable Name: enter the pass through variable key for the postcode the billing address. 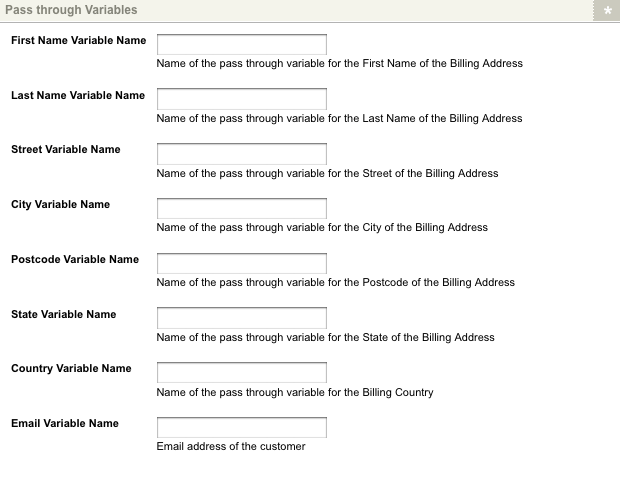 State Variable Name: enter the pass through variable key for the state of the billing address. Country Variable Name: enter the pass through variable key for the country of the billing address. Email Variable Name: enter the pass through variable key for the email address of the customer. This section allows you to change the wording of the buttons for the payment gateway. Submit Button Text: enter the text to display as the submit button. By default, this button will read Submit. This button is displayed when the keyword replacement Submit Button is used on the Display Format Bodycopy. The Display Format Bodycopy is used to define the layout of the SecurePay Direct Post Payment Gateway page. 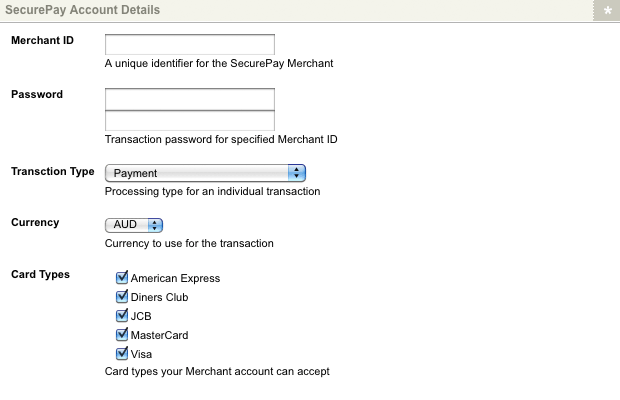 The default layout of the payment gateway is shown in the figure below. Credit Card Number: this will show the card number field. Credit Card Expiry Month (text box): this will show the card expiry month text field. Credit Card Expiry Month (drop-down box): this will show the card expiry month drop-down field. 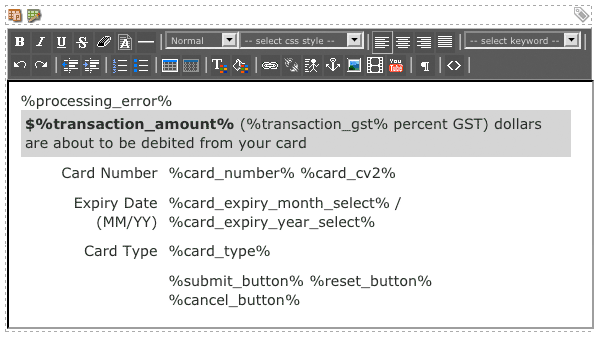 Credit Card Expiry Year (text box) : this will show the card expiry year text field. 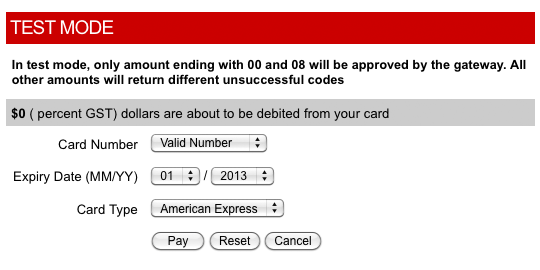 Credit Card Expiry Year (drop-down box): this will show the card expiry year drop-down field. Card CV2: this will show the card CV2 field. Card Type: this will show the card type field. Card Holder's First Name: this will show the card holder's first name field. Card Holder's Last Name: this will show the card holder's last name field. Billing Address Street (Street Number, Name and Type): this will show the customer's street address as specified on the billing address. Billing Address Postcode: this will show the customer's postcode as specified on the billing address. Billing Address City: this will show the customer's city as specified on the billing address. Billing Address State : this will show the customer's state as specified on the billing address. Billing Address Country: this will show the customer's country of residence as specified on the billing address. Customer's Email Address: this will show the customers email address. Submit Button: this will show the submit button on the payment gateway. Cancel Button: this will show the cancel button on the payment gateway. Cancel URL: this will show the URL to cancel the transaction. Reset Button: this will show the reset button on the payment gateway. Transaction Currency: this will show the currency in which the transaction is being carried out. Processing Error (empty if no error): this will show any processing errors. For example, if the user forgets to fill out a field.